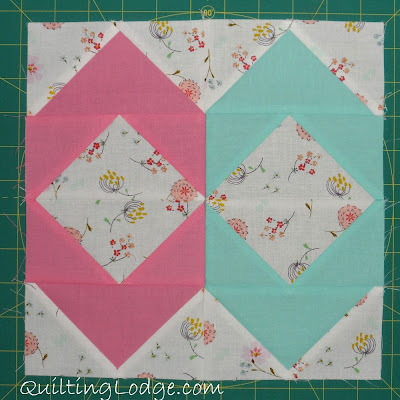 I have a great treat for you today, my wonderful friend Vicki from Quilting Lodge. She knows I have a thing for Flying Geese and has a fantastic review of a new ruler for you. If you have time make sure you hop on over and check her blog out, she has great tutorials and she will be hosting a QAL coming up soon! I’m so honored and excited to be a guest on Melissa’s blog today. 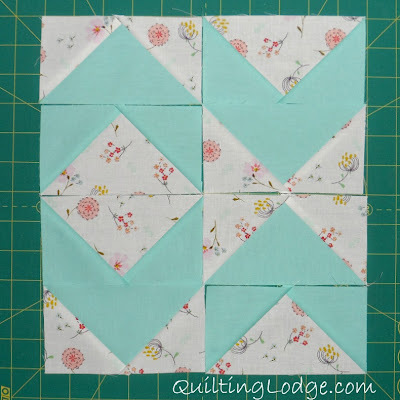 My name is Vicki and I normally blog over at Quilting Lodge with my mom (when she has time). 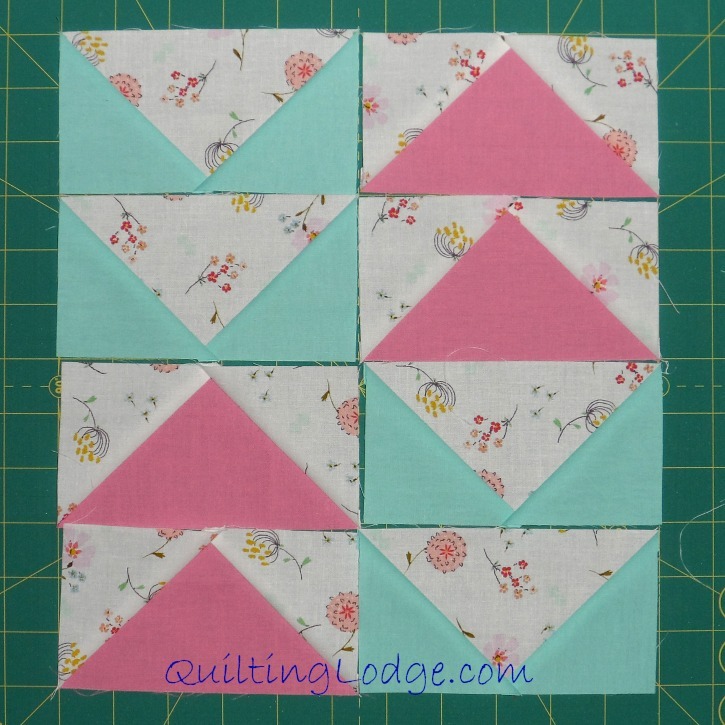 I love to design patterns and quilt. I hope you will stop by our blog and say hello. I’d also love to do a little shameless plugging for my newest adventure, the Texas Teardrops Quilt Along. 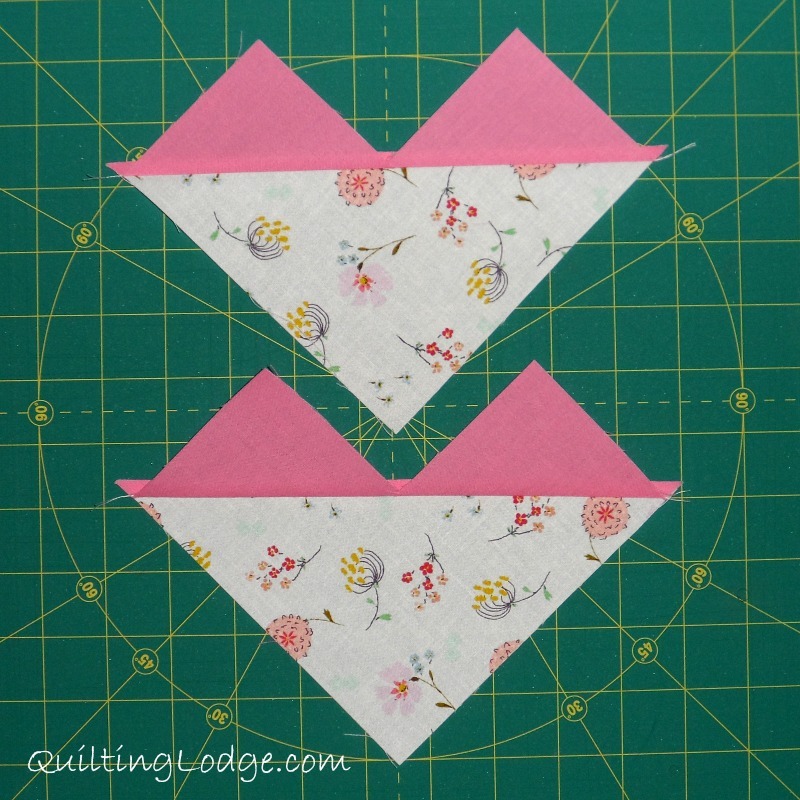 This is my first QAL and it starts April 1st. I’m very excited to share this pattern with everyone. Check it out! 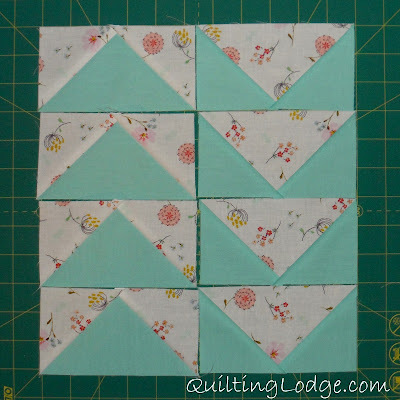 I have to admit I picked today’s topic because I know Melissa loves flying geese blocks and so do I. What’s not love about them? I found a pretty cool ruler that makes 4 at a time. 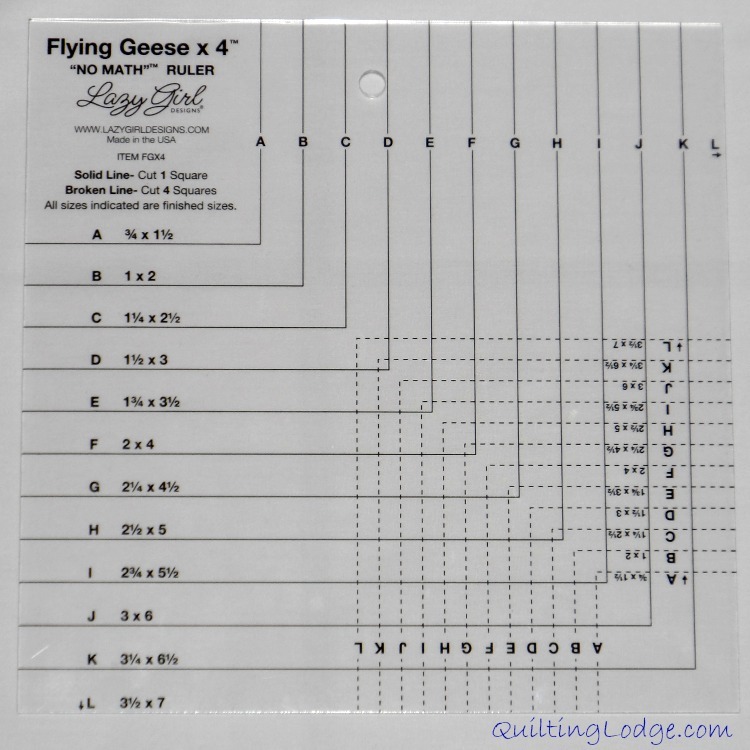 It’s called the Flying Geese x 4 “no math” ruler by Lazy Girl. The ruler comes with great directions that are very easy to follow. I whipped out 16 flying geese units in no time. Let’s take a look at how easy it is. 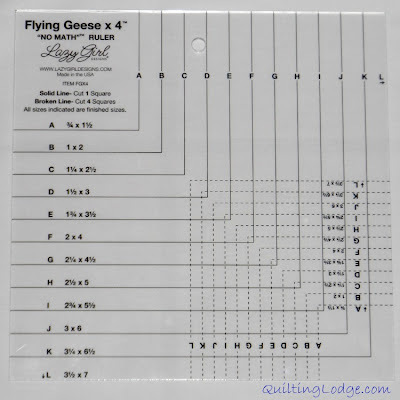 The ruler has all the markings to make flying geese from 3/4″ x 1.5″ all the way up to 3.5″ x 7.” This ruler is clearly marked and very easy to use. 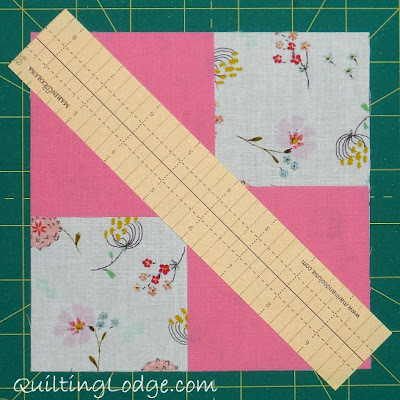 First, you use the ruler and cut 1 large square and 4 small squares. 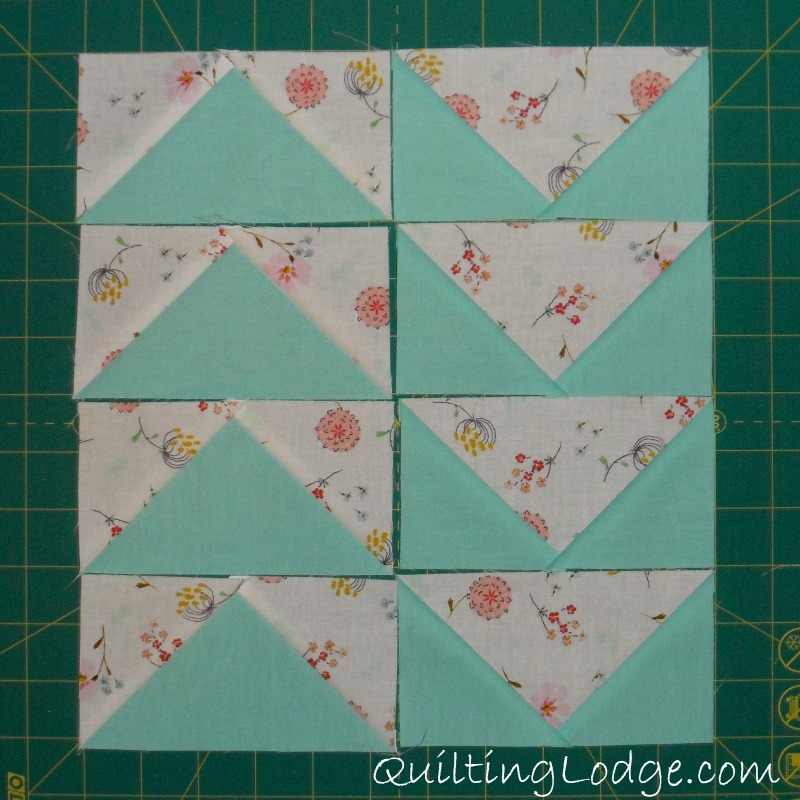 I cut 4 large squares and 16 small squares because I wanted to make 16 flying geese units. 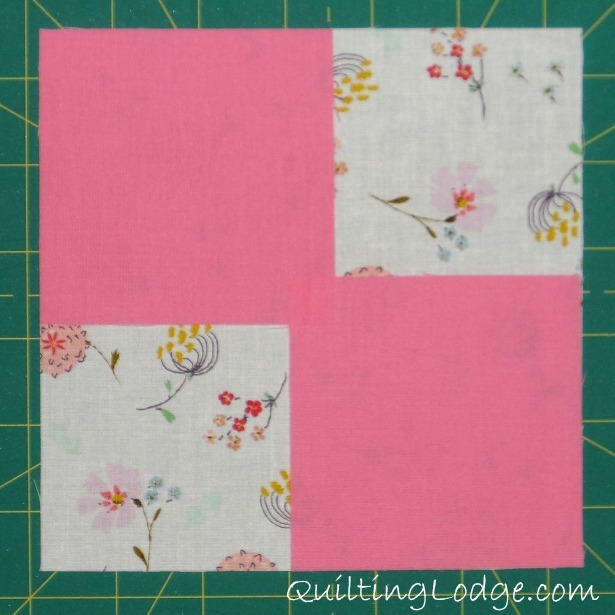 Then lay 2 small squares on top of the large square, right sides together, as pictured below. 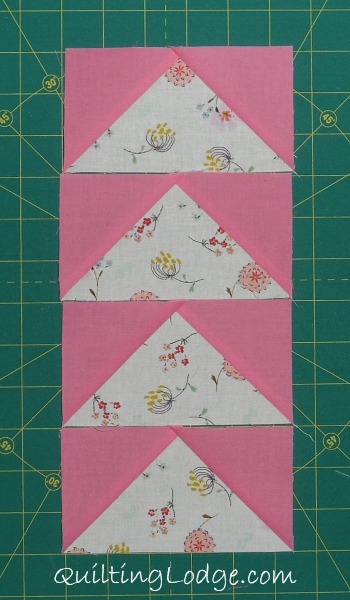 I used some stitching lines to lay across the squares instead of drawing the diagonal line. I’m not a fan of drawing lines on the fabric. I never can get them straight. The stitching lines make life easy because I can simply sew along the dotted lines and then tear the paper off. If you don’t have stitching lines, simply draw a line down the middle and stitch a 1/4″ from the drawn line on each side. 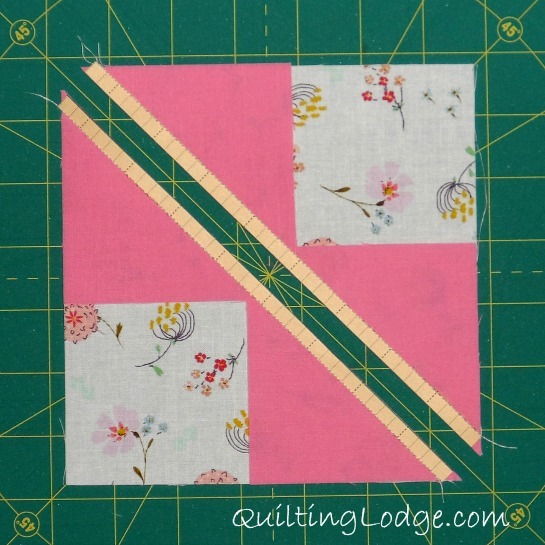 Cut the square in half along the line. Press the triangles. You will end up with 2 units that look like hearts. 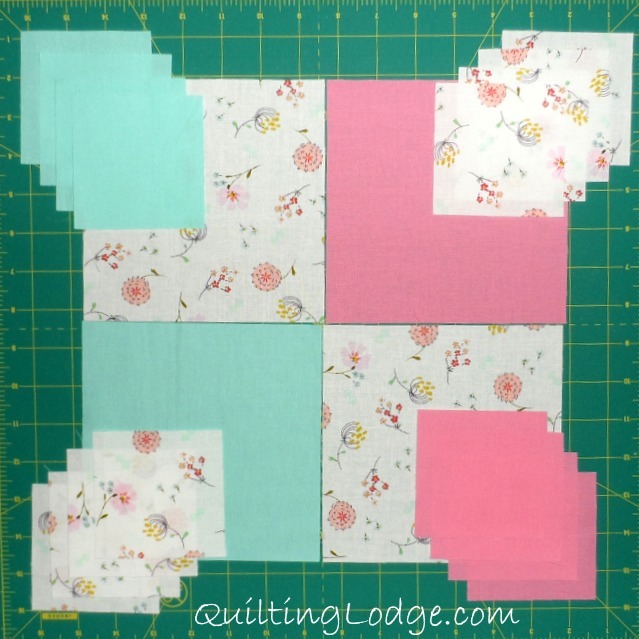 Add a small square to each unit as pictured below. Again, I used stitching lines but you could simply draw a diagonal line on the small square. Stitch the square 1/4″ from each side of the line. Cut the units apart. You will have 4 units now. Press. Ta da! You now have 4 flying geese units. 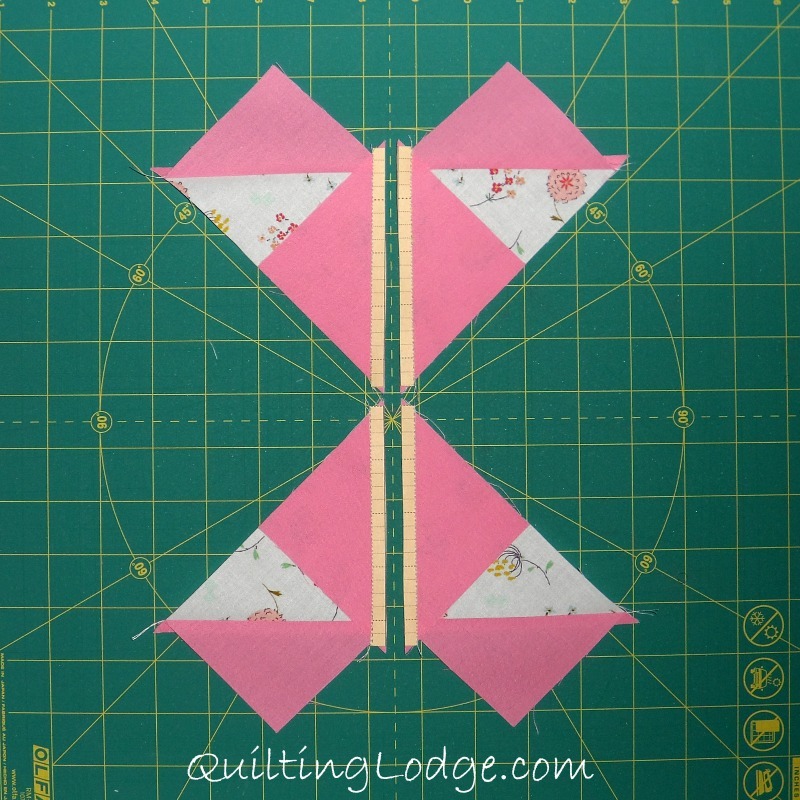 One of the benefits of flying geese is all the layout options. I tried several layouts. This is the one I finally settled on. 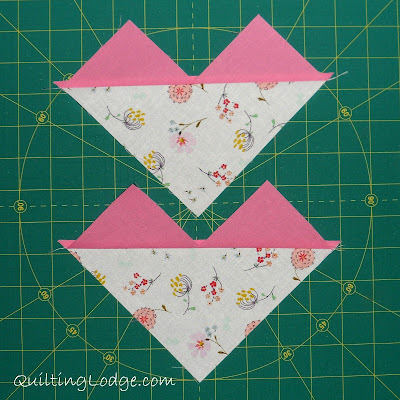 I love how the geese form little chevrons and a diamond in the middle. I would love to do a whole quilt like this. I see lots of possibilities. I hope you enjoyed my mini tutorial as much as I enjoyed sharing it. Please stop by my blog sometime to say hello. And a huge thank you to Melissa for letting me take over her blog today. It’s been a pleasure. 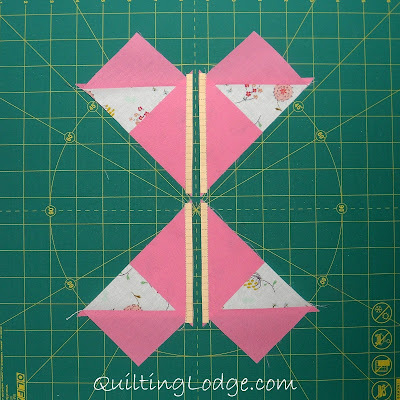 This entry was posted in Guest Post, Quilting Lodge. Bookmark the permalink. Beautiful job, Vicki! I really enjoyed this tutorial. Thank you! This is a new way of making flying geese to me! Thanks so much Melissa for letting me take over your blog for the day! I hope you’re enjoying your vacation. Wow, I love both the products you showcased here. That stitching line tape is genius. Oh, how I love your flying geese. I will need to get this ruler. Thank you for this tutorial. It is one for me to save. A ruler to help you cut sounds great! 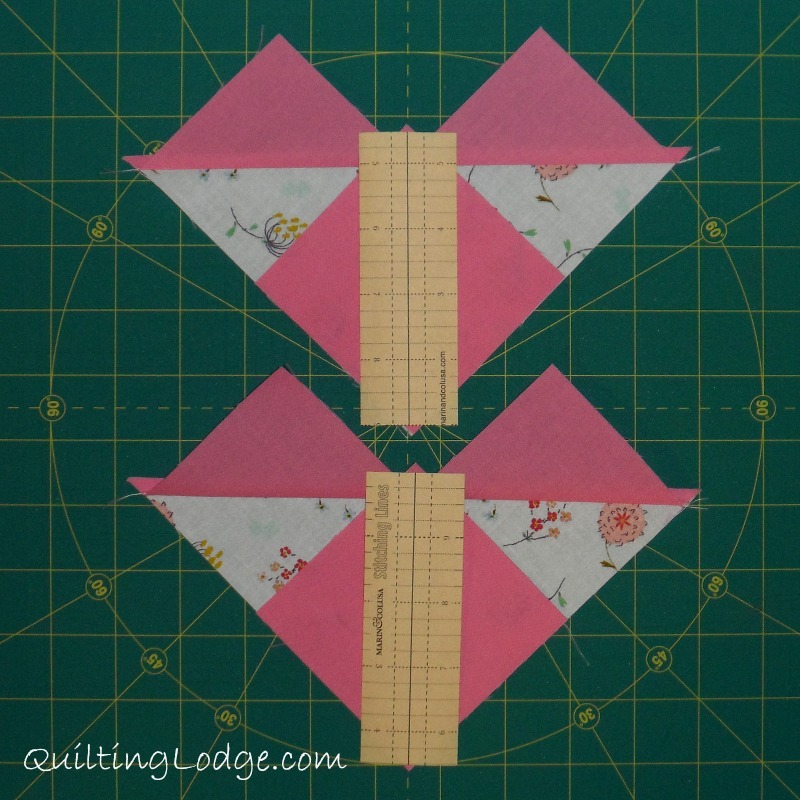 I love this method of flying geese–no waste and so quick! Thanks for showing how to make these flying geese blocks the easy peasy way!!! Love it that there is no waste! You make it look so easy, I just found out about Stitching lines a few days ago,thanks for the tutorial. I like the idea of the stitching lines, but I’m afraid you’d really have to be going some to convert me to triangles, they’re my nemesis! You both are great gals! 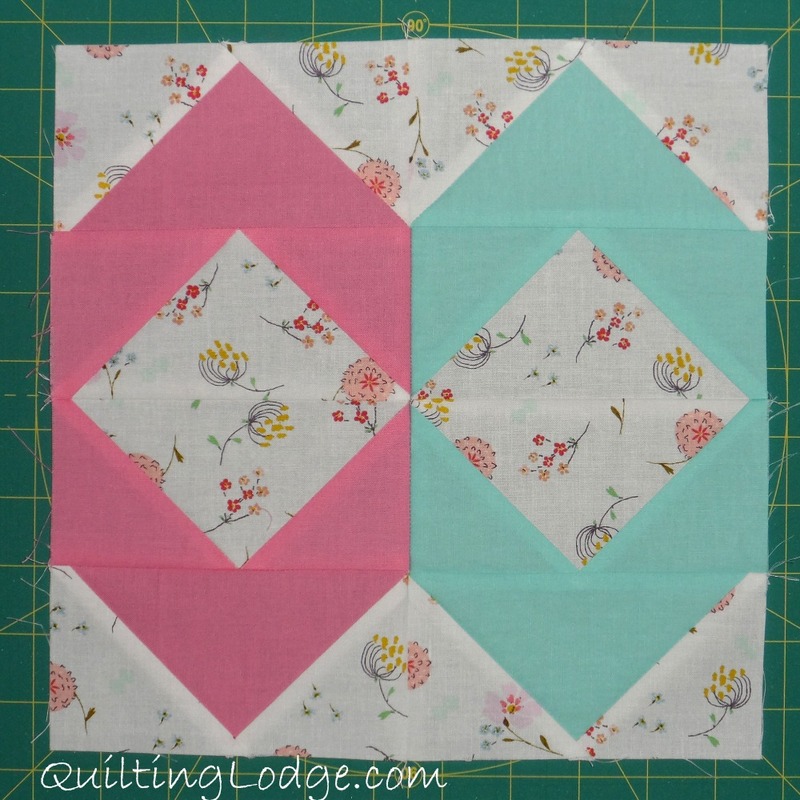 hi Melissa, I will go tell Vickie hi too..
My sleuth thinks it’d be a handy Lazy Girl, no math flying geese ruler and/or/and perhaps a Texas Teardrop pattern to sew along come Monday.